I haven’t been able to post to the blog because we’ve all been having too much holiday fun. First there was Thanksgiving, which we hosted. In our experience, dogs love Thanksgiving. Even if they don’t get a seat at the actual table, turkeys produce many edible scraps. And the whole feasting business generates a Macy’s Parade of wonderful smells. 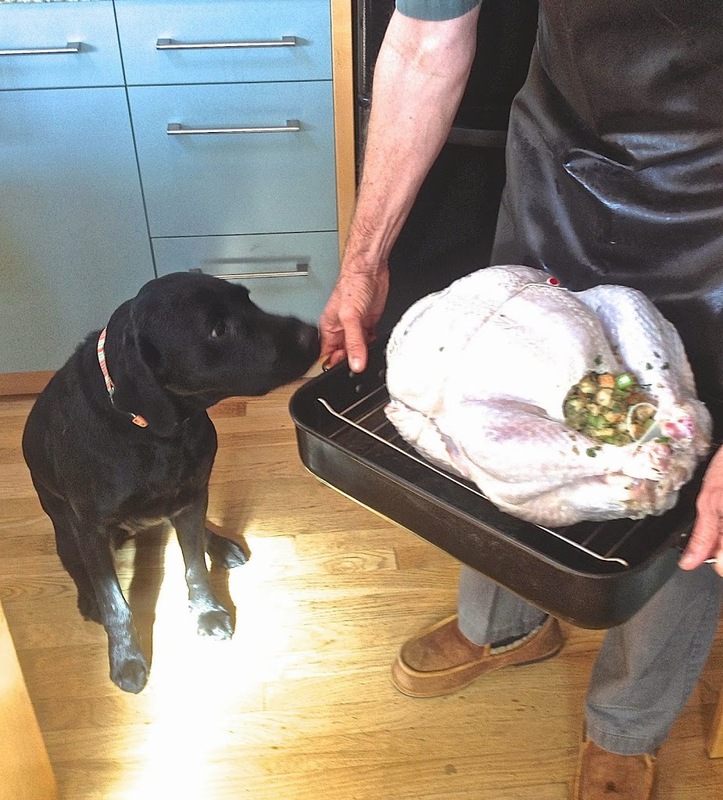 Because Dionne is an unusually curious pup, we thought she’d be spellbound by the turkey. But something about it made her uneasy; she had to be aggressively coached to come near the roasting pan before it went into the oven. And once it began to brown, her nervousness and suspicion only seemed to intensify. 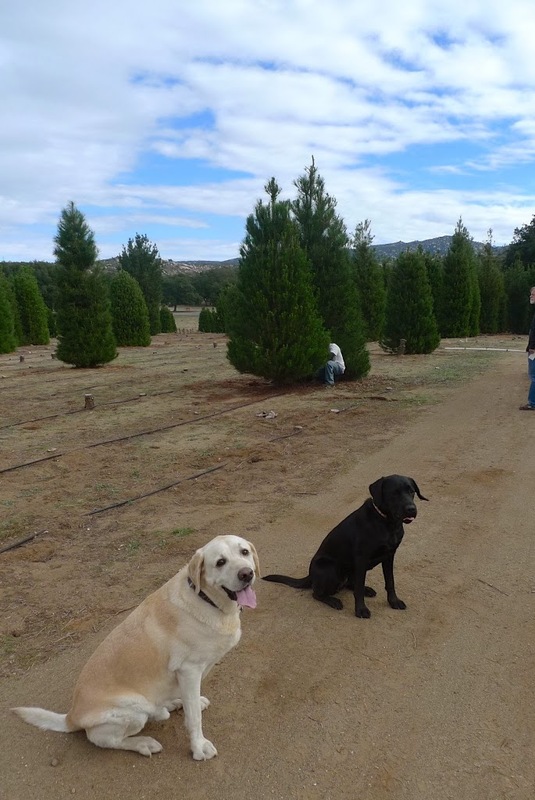 The next day (Friday), Steve, Tucker, Dionne, and I set out on an adventure that offers dogs more unalloyed bliss — our annual excursion to a little Christmas tree farm not far from the Mexican border. It’s one of the few places left in San Diego County where you can still pick out a tree to cut down. More important for visiting dogs, the owners don’t mind if they run free. Tucker was the one who got in trouble, disappearing altogether at one point. I discovered him inside the owners’ house, where he was making himself at home. This morning we set up the tree without incident. Tomorrow we’ll decorate it. Dionne’s never seen that before. But she says she’s sure she’ll approve. My friend Howie passed along a link to comic photos of dogs caught in mid-lick by photographer Ty Foster. They certainly amused me, and I can imagine that Foster’s upcoming book project will find a ready audience among fans of silly dog photos. I’ve known people who like their dogs to lick them, equating the licking with “kisses.” It’s a pretty obnoxious behavior, to my mind (and the dog pros seem to see them more as a sign of submission than affection.) Happily, Dionne licks us only occasionally and is easily discouraged. The tongue weirdo in our current pack is Tucker. Occasionally, he’ll sit and draw his own tongue in and out. To us, it looks like he’s savoring whatever food molecules continue to cling to it. Once he starts, we’ve seen him keep this up for minutes on end. Clearly, I’m not as good a photographer as Foster is. But Tuck thought it was a fun experiment. I’m allergic to cats. Prolonged contact with them makes my eyes water and starts me sneezing. That’s probably why we haven’t picked up one or two over the years. 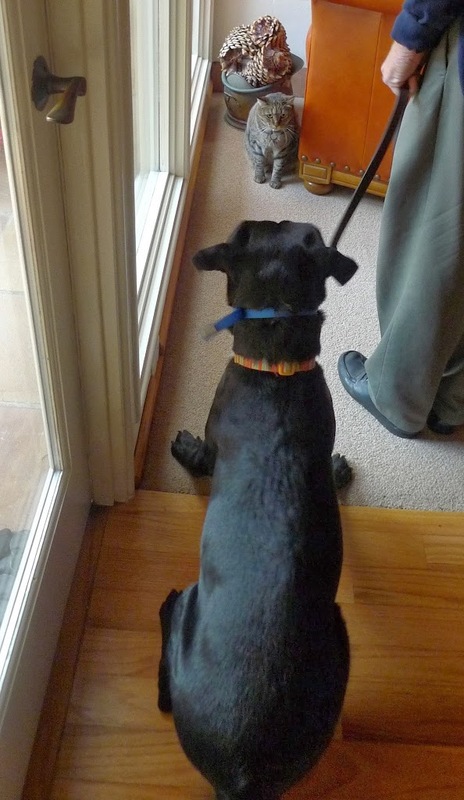 But the fact that we can’t have one means our CCI puppies have no preparation for Close Encounters of the Kitty Kind. We’ve never been told that any of the dogs we raised were released because of going berserk in the presence of a feline, but we worry it could happen. The Oceanside campus reportedly is home to a surly cat named Bob who delights in tormenting the puppy trainees. 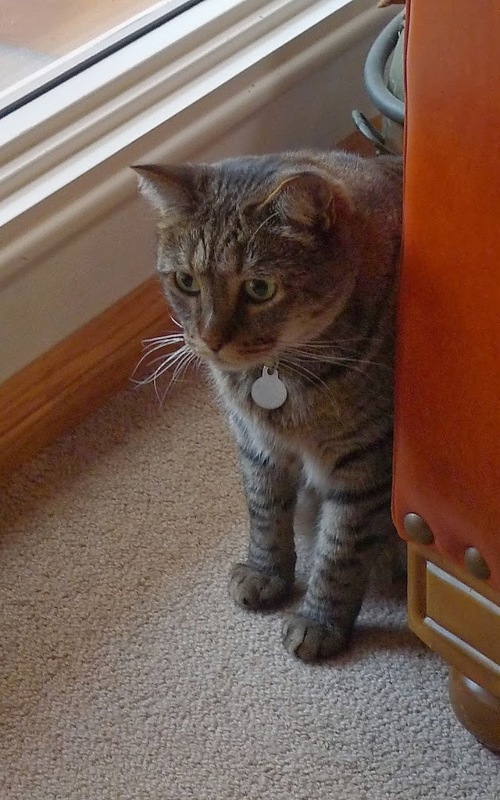 We suppose that one day Bob will move on to the Land of Unlimited Catnip, but as far as we know, he’s still alive and snarling. So this time, raising Dionne, we’ve decided to be proactive about preparing her for any run-ins with him. Our good friend Christy has two cats. One’s so shy she only emerges for Christy. But the other is a sturdy hunter who’s unfazed by canines. The other day we took Dionne over for an introduction to Max. We found him relaxing next to an armchair. He didn’t bat at eye, as Steve led Dionne, on-leash to a few feet away from him, and it took a minute or so for her to realize that the gray smelly object in front of her was AN ANIMAL!!! Still, she kept it together reasonably well, even when Steve reached out to pet Max. We could tell she wanted to tackle him. For fun!!!! But we decided not to push things by letting her off the leash. She really wanted to play…. 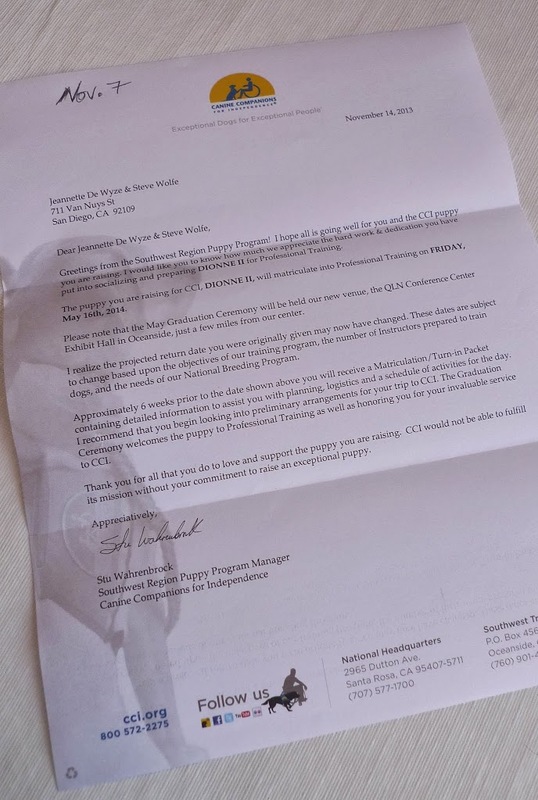 My stomach lurched just a bit when I opened the envelope from CCI and saw that the subject was Dionne’s upcoming turn-in to the Oceanside center. For a moment, I feared that the start of her Advanced Training had been moved up three months sooner than the date we were given when we received her last December. I’ve heard of this happening to puppy-raisers, on rare occasions, and it’s brutal. But no. The date of her turn-in remains Friday, May 16. That’s six months off. Yet somehow, creepily, it feels like it’s right around the corner. 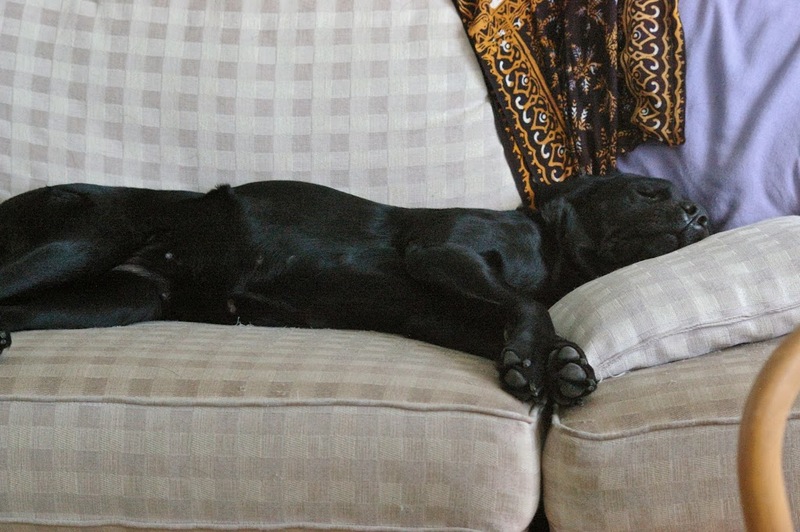 Trouble aloft for service dogs? Airlines, which does not welcome puppies in training. (The law requires them, like all airlines, to let actual working dogs come aboard.) I understand that American Airlines, our most frequent choice when flying longer distances, does allow canine trainers in its cabins. But frankly, we both shudder at the thought of flying with any puppy for more than an hour or so. It feels like it would add stress to any pleasure trip and push any working trip into the red zone. Still even though flying with a puppy is not on my personal to-do list, I felt uneasy reading the New York Times article about “emotional support” dogs and the growing (according to the Times) backlash confronting them. I had no idea that the federal Air Carrier Access Act allows you to take your dog with you, even on planes, for free (! ), if you can get a mental health professional to write a letter saying that you need the animal’s comforting presence. Astoundingly, the emotionally supportive animal can even be a cat, a monkey, a miniature horse, of a potbellied pig, the article says. It’s enough to make me want to head for the hills — on a train. 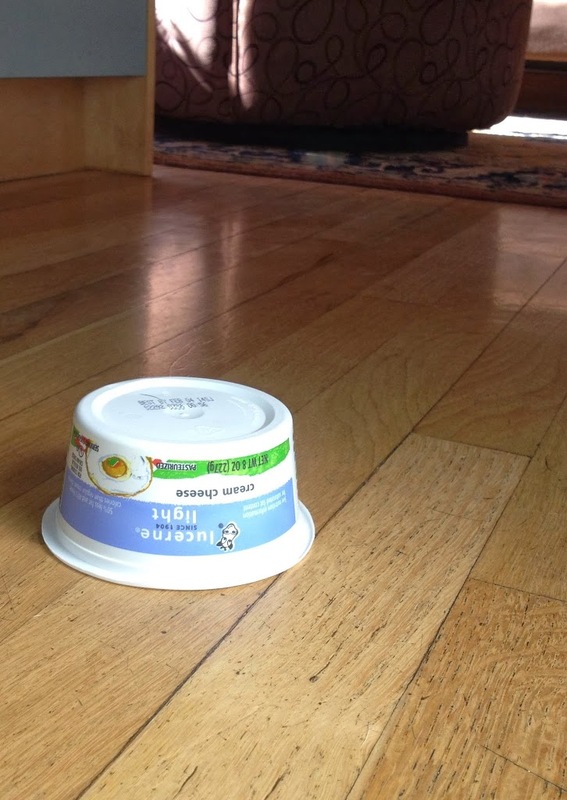 … was on the floor, clean as the cliched whistle, when I returned a few minutes later. 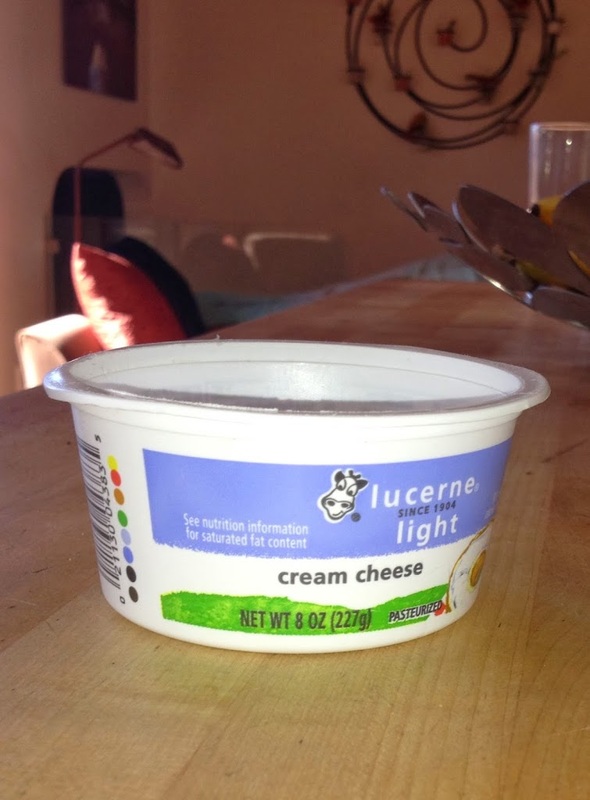 Happily for me (not so for her), there wasn’t much cream cheese left in it. Dionne loves cream cheese, with which we often fill her Kong and give her as a treat and form of amusement. 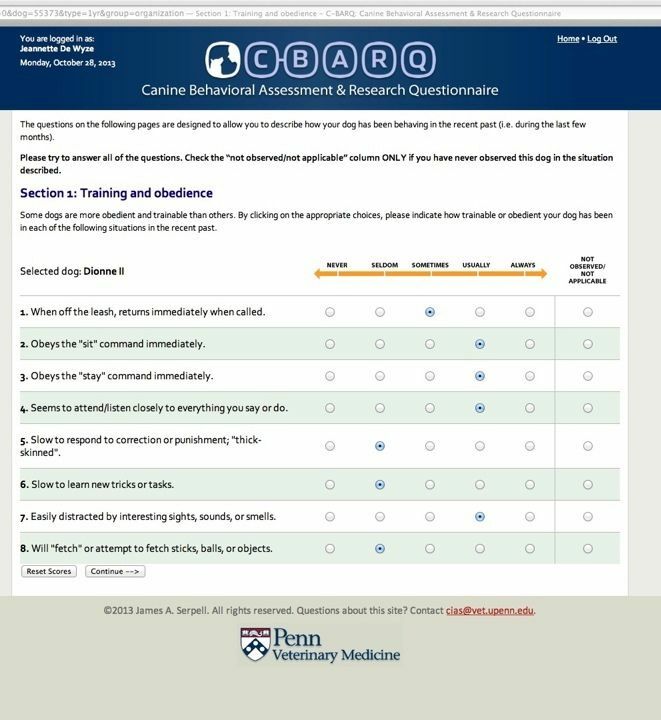 Last month, around the time of Dionne’s first birthday, I received an email telling me it was time again to fill out the Canine Behavioral Assessment & Health Questionnaire (CBARQ). This is an ongoing project of CCI’s, in collaboration with a couple of guide-dog-for-the-blind programs. 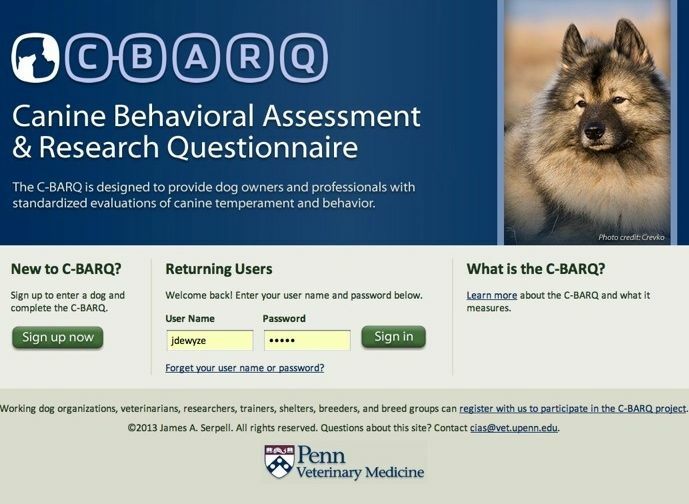 The idea is to refine the assessment and quantification of doggy behavioral traits. A professor at U Penn is conducting the research. What we puppy-raisers do is to fill out questionnaires when the pup is 6 months and one year old. I did it for Brando and Darby and, now, Dionne. It’s a little tedious — pages of questions and never any feedback about what the data is showing (unlike the Dognition project that we participated in last summer). But I comply, partly because I’m a reasonably dutiful puppy-raiser, and partly because I hope there’s a scientific pay-off for all of us answering all those pesky questions — somewhere down the road. It makes me think: if she continues at this rate to grow calmer and ever more focused, six months from now she’ll be a superstar! And in the meantime, she’s a LOT easier to live with.